It is 3 km away from Baba Baidyanath station. It attracts a lot of people. There are few temples on the hill and inside them the idols of Shiva, Parvati, Ganesh and Kartik have been installed. There is a water tank from where filtered water is supplied to each corner of Deoghar through pipes. The sunrise and sunset from here is a charming scene. 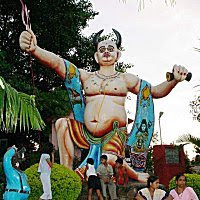 It is said that once King Ravana tried to enter Shivadham forcibly. Nandi was the door keeper at that time. Nandi obstructed him. Ravana became angry and threw him who fell here and in this way this hill became to known by this name. Here a park named Nandan Hill Entertainment Park has been constructed. It is a favourite spot of tiny - tots. Facilities of swinging, boating etc. are available here. It is situated in the western side of the Deoghar town. It has got importance in the religious history of Babadham. One can view the beauty of Deoghar from here.